Do you watch Sesame Street? 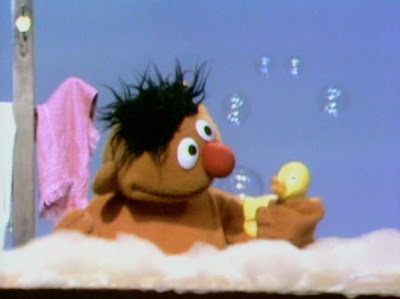 Do you remember the times EARNIE takes a bubble bath then Bert comes in and a whole commotion starts? Those were the times I enjoyed my bubble baths too, not to mention I had my own version of that Rubber Ducky he had. I was checking out some bath products in the mall and the one that I had my fancies on was this bottle of bubble soap which I did not normally use when I was a kid. My bubble baths then were just made of a popular brand of shampoo that made that foam I enjoy. I still do now actually; but I don't fit those small basins anymore so I go full throttle with large bath tubs and a Jacuzzi whenever I can. I guess that's a part of water therapy where I get some quiet time to at least have my break and meditate. The self made spa retreat I made for myself these past few months even got my skin whiter and softer. It is not one of those expensive treatments you normally get in LA but it gets me what I need whenever and wherever I am. I personally know its safe because I get the best hot tub chemicals this side of town to clean it up. I would not want to have those molds and mildew you know because I don't want to get sick. I hope everybody does the same because most of the time, children are the ones affected. Better safe than sorry right?